Lost Tribe Sound has been relatively quiet in 2018, but they’re about to return with a vengeance. The new subscription series We Stayed The Path That Fell To Shadow includes four LPs, four CDs and some digital perks as well as early subscriber discounts. It’s easily one of the highlights of the late year, and this is your chance to get in on the ground level. The label is known for its great roster, as well as its attention to creative packaging, so this was an easy choice for me; it only took me a minute to subscribe, and now I’m looking forward to a steady stream of great music from now through summer, when the full package will arrive. 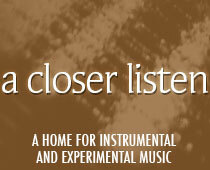 The initial sampler may be regarded as a teaser, an overture or a super-early preview. The music whets the appetite for the full albums; it’s going to be hard to wait. William Ryan Fritch is represented by two tunes, the first being the gorgeous “Gut Level” from Music for Film Vol. II. We loved the first volume, and anticipate that the new volume will be just as powerful, if not even more so. There’s also a subscriber-exclusive track, “Prosaic Ending”, which reminds us of Lost Tribe Sound’s Leave Me Subscription Series, the precursor to the new rollout. Fritch is the label’s anchor artist, but he deserves the tag; the name is synonymous with quality. So let’s take a look at the other names. There’s Gavin Miller, who we still love for last year’s lightbulb EP ~ his slow-growing “I” is the finest track on the sampler, while also being the longest track with the shortest title. Beginning humbly, the piece builds simply on a theme until Aaron Martin lifts the emotion to the stratosphere. Then there’s LTS “find” Skyphone, for whom the label is doing a double service, as they did with Alder & Ash, reissuing the earlier Hildur (available immediately for subscribers) as well as a new work. Each is represented here, crisp and calm, making full use of the stereo field. The newer track pushes the bass up front, drawing a line of distinction between the works. Luton follows up this spring’s Black Box Animals with what another dark yet beautiful set, introduced with the tender piano and foreboding crunch of “Step Into the Void,” fading into drone at the end. Spheruleus offers a slow and heartfelt meditation on “Winnowers,” while new signee The Phonometrician is announced by “Here Comes the Storm.” As his album is the only one offered on both CD and vinyl, it’s clear that the label has put great faith in him; from the sound of the first track, we won’t be disappointed. Then there’s the instinctive team-up of From the Mouth of the Sun and Seabuckthorn on closing track “Lesser Still”, exclusive to this release and a hopeful sign of things to come, although no collaborative album has been announced yet.